Qantas (a great airline) has dropped the price of their February, March, and April 2018 flights from Montreal to Sydney, Australia down to $969 CAD roundtrip including taxes. There are also a few flights available in November 2017. On FlightHub, the flight will show up as a 'phone only' fare. Click on 'Select' and the phone number to call will show up (1-800-755-4580). Feb 5 to Feb 15 -- new! Feb 12 to Feb 21, 22 -- new! Feb 14 to Feb 21, 22 -- new! These are just examples dates. Try other dates in February, March, and April 2018. Look for the dates that are $969. Click on these flights. You may want to try a few different date combinations. Try to find the flights that have around a 2 hour layover each way. Not every date combination has the ideal 2 hour layovers each way. But the flights do have 3 stops on the way there! (1 on the way home). 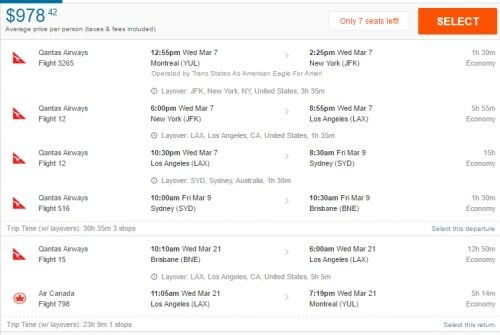 3-in-1 trip: You can now also find some interesting multi-city combinations that allow you to spend time in Sydney, Brisbane *and* Los Angeles for $1069 CAD (for all flights). 4. As for the dates to use, try using the regular roundtrip dates from the list above for the first and last legs of the journey. You can play around with the middle date(s) to see how it affects the price. Update 9/25 - These are back again today. 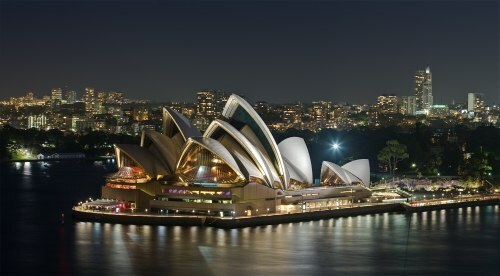 montreal, yul, australasia, oceania, sydney, australia, syd, brisbane, bne and qantas. 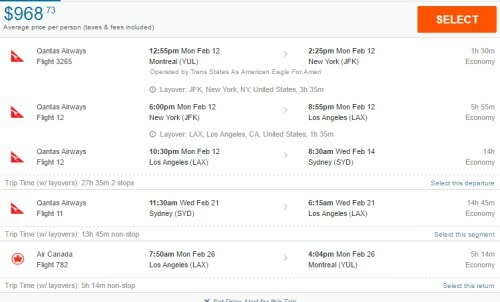 2 Responses to "Montreal to Sydney, Australia - $969 CAD roundtrip including taxes on Qantas | add Los Angeles for free"
With two different companies, how risky is this? If Air Cacanada is late on the first leg, do I lose the next flight and have to pay for a new one? Thanks! 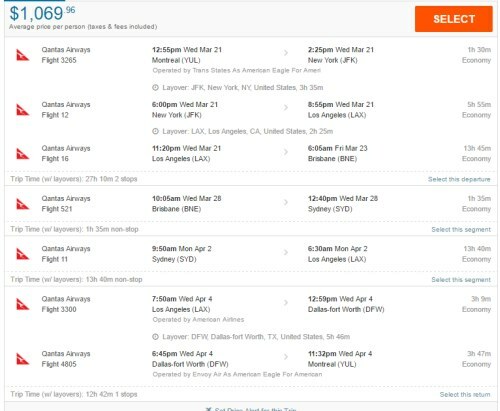 Whenever you book a trip on a single ticket that involves multiple airlines, the airlines are responsible for getting you there (free of charge) if a delay or problem causes you to miss a connecting flight. It should be noted that this is the same whether you booked it through a third party booking site, or with the airline itself. Most airline websites allow you to book journeys involving multiple airlines. There are many, many international flights that involve taking different airlines, and if people had to pay for a new flight whenever they missed a connection, well, you can imagine the anger. However, it can certainly be less of a headache to get the situation resolved when the airlines have some sort of association with each other (same alliance or codeshare partners). The airlines will look to their partners first to get you on the next flight. Air Canada and Qantas aren't officially codeshare partners or in the same alliance, but they do have an 'interline agreement'. Bottom line: You definitely would not have to pay for a new flight if something like that happened. The airline would put you on the next available flight, free of charge.